Once you have your electric drill whether it is a corded, or cordless electric drill. You need different types of drill bits and accessories to make this amazing tool useful. 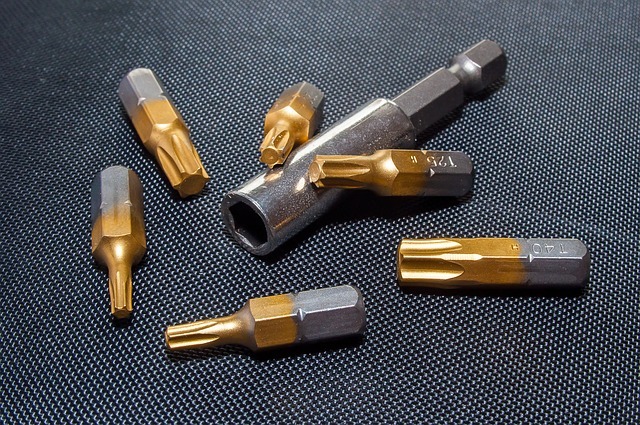 What follows is a list of the common types of drill bits and their uses. This way you can look at your project plans and determine which ones you will need. These bits are designed primarily for metal-work, they’re also good for Standard wood boring. Twist drill bits also known as “Carbon steel” bits are very adequate for woodwork. Helpful hint: One problem with twist drill bits is that they are more difficult to center on a precise mark. 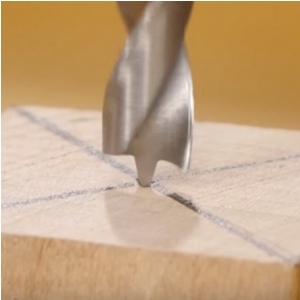 When drilling wood, start a larger hole with a 1/16 inch “pilot hole” to keep a larger twist bit (over ¼ inch) on track. 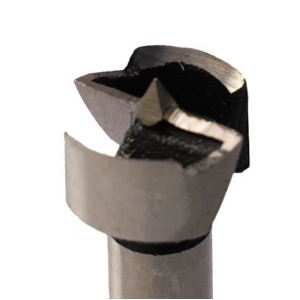 Drilling metal is even more difficult so be sure to use a center punch to precisely mark the spot you are drilling. 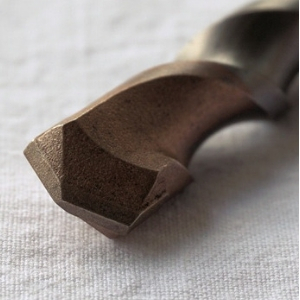 As a woodworker, a complete set of twist drill bits up to one-half inch in diameter will be necessary. Twist drill bits larger than 3/8 inch have a "reduced shank" so that the large shaft can fit into your drill. I suggest purchasing large bits as needed since they are not that commonly used. 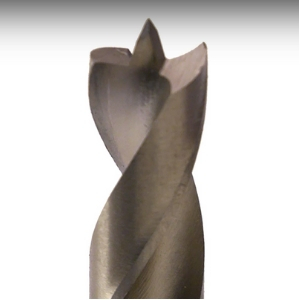 The Brad-point drill bit is a twist drill bit with a sharp center-point that prevents it from wandering off your mark and it has two Sharp spurs that cut a clean-edged hole. These are my favorite bits for working with wood because they are so precise, however, they are more expensive. When just starting out it’s good to have several common sizes such as 1/8, 1/4, 3/8 and 1/2 inch bits. Fairly inexpensive bits for drilling large holes. Spade bit sets are usually from ¼ inch to 1 ½ inch in diameter. 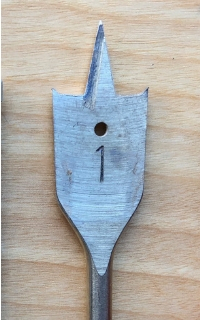 A Spade bit has a long “lead point” that makes centering the bit on your mark very effective. A full assortment of these bits is essential. Made with very hard tungsten carbide tips attached to steel twist drill bits these are designed to Bore holes in concrete, brick, or stone. Exceptionally high-quality drill bits for boring larger holes. I recommend purchasing them as needed for your projects as they’re quite expensive. They make very clean and flat-bottomed holes that are not affected by varying wood grain or knots. you can even overlap holes with a Forstner Bit and get exceptional results. 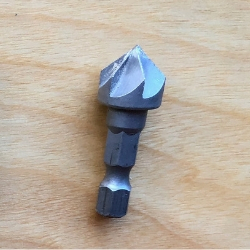 Countersink bits will make a tapered recess to accept the Head of a countersunk wood screw. First drill your whole, then set the point of the countersink bit in your hole and run the drill at a hi-speed to make a nice clean countersink. 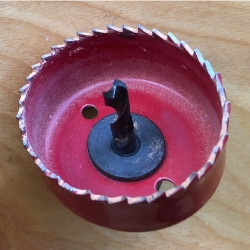 A holesaw blade is clamped to a twist drill that passes through its center. Hole saws are generally sold in a set ranging from 1 inch to 3 ½ inches in diameter. 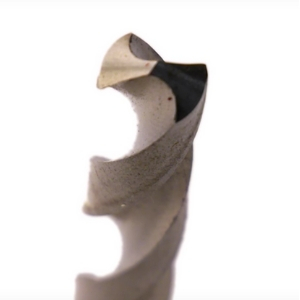 The shank of the bit is secured in your drill and the saw blade spins to cut a large hole. 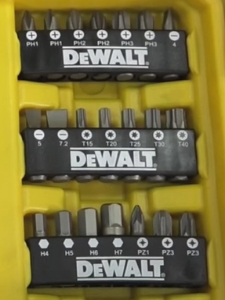 These are very useful for projects where you need a large hole all the way through your stock, such as when installing a doorknob or deadbolt lock. For every screw manufactured today there is a screwdriver bit to fit your drill. Most common are Phillips and Torx. I strongly recommend avoiding the standard slotted wood screw for use with a powered drill screwdriver bit. The bit has nothing to anchor it in the screw. Every time I have used one it resulted in slipping off the screw gouging the project with the bit and/or drawing blood from myself because it is virtually impossible to keep the screw bit in the slot while it is rotating. With the proper bit and screw combination, you will be amazed that it took so long for these to be invented! 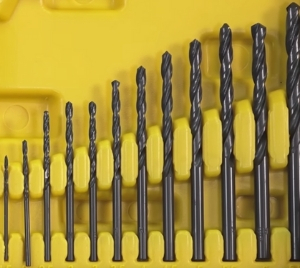 I hope you now have a better understanding of the types of drill bits and what they are used for so you can get started woodworking with all the right tools. Let me know what projects you are working on in the comment section I’d love to hear about your woodworking successes! Hi there! I just want to give a huge thumbs up for the good data you’ve right here on this post. I will be coming back to your blog for more soon. Hey thanks for taking time to comment! I hope to hear from you again soon! HI, I’m Greg. I love helping people get started working with wood. On this site I wanted to give people, especially beginners the “tools” to confidently go out and start woodworking projects and buying woodworking tools and equipment. Please take a look around and let me know who you are in the comments.